Very little has to be said about this car, but let’s say a few words anyway. Three of them are: Best, liveried, 917. Yes, enginerrrrrrrrrrrrrrrrrrrrrrrrrrrrrrrrrrrr I see your Hippy argument but I still stand by my words. It’s just so classic! Plus, it has a striking simplicity to it. Just red with wote headlight surrounds and ten white stripes. that’s it. And the recent Porsche 919H inspired by it is just as great. 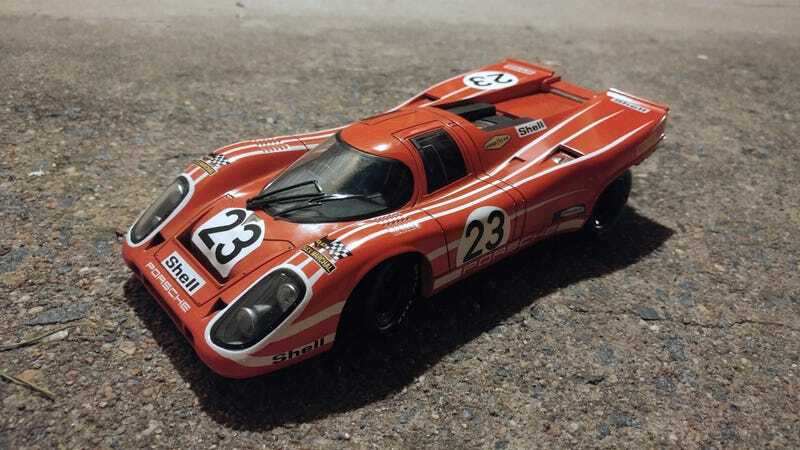 This car, driven by Richard Attwood and Hans Herrmann for the Porsche Salzburg factory team, scored Porsche’s first overal victory at Le Mans at the 1970 race. After qualifying 15th, they survived the true race of attrition. There were only 7 ranked finishers, 5 of which were various Porsches, including a 917LH (2nd), a 908 (3rd), a 914-6 (6th), and a 911S (7th). The other two were Ferrari 512s finishing 4th and 5th. The 917 in various guises continued to dominate racing until the 1973 season (the 1100hp 917/30 in Can-Am), and was raced once more at Le Mans in 1981 (DNF after a collision), and at Brands Hatch 6hr race, where it ran well until it retired with suspension failure. I’ll take better photos of this Universal Hobbies 1:18 model another time, but for now let’s just enjoy it. For not being a model that opens at all, there is pretty good detail on the bottom end, the interior looks well-appointed, and the decals are very nicely done. PS: 964 Targa update! I replaced the Targa bar I had previously made out of aluminium with a slightly thicker styrene example. It seems to hold better to the body, and it matches the thickness of the ZAMAC. Needs some slight shaping, and then the challenge of making a rear window starts. Any ideas...?